Wanna see something really scary? You kind of will, and you kind of won’t in my Halloween week Telly Addict, as I’ve been careful not to put in scenes of too much violence and horror that some viewers may find upsetting, from the start. There will be blood, though, with the choleric return of Ripper Street to BBC1, the nightmarish return of American Horror Story to Sky Atlantic, the imminent conclusion of Bates Motel on Universal, and the blood-sucking debut of NBC’s Dracula on Sky Living (if you can call it living etc. ); also, a celebration of screwball dialogue on Veep on Sky Atlantic and some frankly terrifying lady-in-peril thriller cliches on The Escape Artist on BBC1. Don’t submerge your head in that bath! Then this is the Telly Addict for you. It’s got Luther on BBC1, which, if you didn’t see the first episode, is now officially the more terrifying programme on TV. They’ve rustled up a serial killer who makes The Fall‘s Paul Spector look like a nice family man who isn’t actually a serial killer; also, while we’re on “scary”, there are honorable mentions for The Returned on C4 and The Walking Dead, whose third season, the one with David Morrissey, has just transferred from Fox to Channel 5; on a lighter note, Dates on C4, which came to an end last week; and the surprisingly grown up, valedictory Skins: Fire on E4, from Bryan Elsley, who’s also the creator of Dates (clever man, with a clever son, Jamie Brittain, who wrote my fave Date with the great Greg McHugh, and a clever daughter, Jess Brittain, who’s writing the first Skins story); a summary dismissal of ABC’s Scandal, whose second season came to fail to fill the gap left by The Good Wife and Nashville on More4 (sorry! ); plus a moment of Zen from BBC2’s superb Route Masters. 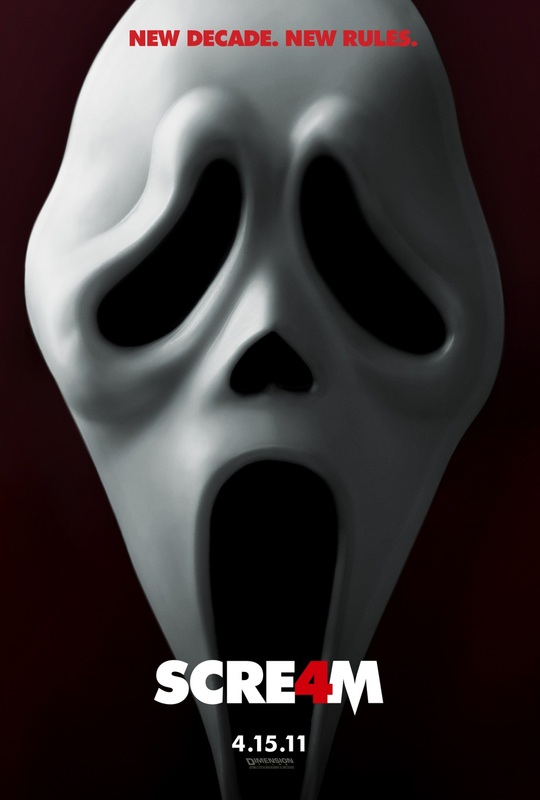 So, after one false start on Tuesday, I finally saw the new Scream film last night. On Tuesday, there was a fire alarm at the Soho Hotel, where it was screening, and the assembled critics were told that the fire had been in the projection room, so it was cancelled. This was a pity, because a) the film distributor, Entertainment, are known for not always tripping over themselves to lay on advance press screenings, and b) we’d all signed our forms. These are not unheard of, especially in the age of digital media, but most film companies have dispensed with them, and critics are trusted not to be silly. You are about to view the film “SCREAM 4.” In doing so, you acknowledge that this film is property of Dimension Films and as such: (i) you agree to be bound by an obligation to keep certain contents of the film strictly confidential and you will not disclose such contents to anyone, including but not limited to the press, the media and the general public or write about it in a blog, on Twitter, Facebook, etc. These contents include the ending of the film, kill scenes and who remains alive in the film; (ii) you will make no video copies nor take any photos of the film. By signing this document I hereby confirm my understanding that all reviews (including any article or review containing my personal opinion of the film) of SCRE4M (aka Scream 4) are embargoed in all forms (including newspapers or magazines, broadcast outlets such as TV or radio or digital platforms such as websites, blogs and social networking sites including such as twitter and Facebook etc) until 5pm, Wednesday 13th April unless otherwise agreed in writing in advance with Entertainment Film Distributors.